It never thought that no one would notice it down in the grass, and that it was a poor, despised floweret. It was very merry, and turned to the warm sun, looked up at it, and listened to the lark carolling high in the air. Within the palings stood many stiff, aristocratic flowers – the less scent they had the more they flaunted. 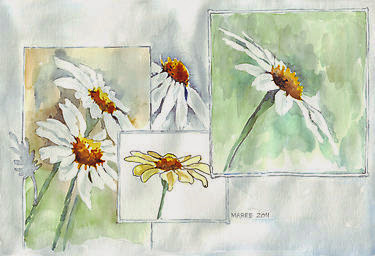 Just as she thought that – “keevit!” Down came flying the lark, but not down to the peonies and tulips – no, down into the grass to the lowly daisy, which started so with joy that it did not know what to think. The little bird danced round about it and sang, “Oh, how soft the grass is! And see what a lovely little flower, with gold in its heart and silver on its dress!” For the yellow point in the daisy looked like gold, and the little leaves around it shone silvery white. How happy was the little daisy – one can conceive how happy! The bird kissed it with his beak, sang to it, and then flew up again into the blue air. “Here we may cut a capital piece of turf for the lark,” said one of the boys; and he began to cut off a square patch round about the daisy, so that the flower remained standing in its piece of grass. “Tear off the flower!” said the other boy, and the daisy trembled with fear, for to be torn off would be to lose its life; and now it wanted particularly to live, as it was to be given with the piece of turf to the captive lark. And so it remained, and was put into the lark’s cage. But the poor bird complained aloud of his lost liberty, and beat his wings against the wires of his prison; and the little daisy could not speak – could say no consoling word to him, gladly as it would have done so. And thus the whole morning passed. “If I could only comfort him!” thought the daisy. The evening came on, and yet nobody appeared to bring the poor bird a drop of water. Then he stretched out his pretty wings and beat the air frantically with them; his song changed to a mournful piping, his little head sank down toward the flower, and the bird’s heart broke with want and yearning. Then the flower could not fold its leaves, as it had done on the previous evening, and sleep; it drooped, sorrowful and sick, toward the earth. Not till the next morn did the boys come; and when they found the dead bird they wept – wept many tears, and dug him a neat grave, which they adorned with leaves and flowers. The bird’s corpse was put into a pretty red box, for he was to be royally buried – the poor bird! While he was alive and sang they forgot him, and let him sit in his cage and suffer want; but now that he was dead he had adornment and many tears. But the patch of turf with the daisy on it was thrown out into the high-road; no one thought of the flower that had felt the most for the little bird, and would have been so glad to console him.